Location: Mt. Baldy Visitor Center. From I-210, take Mountain Avenue north (it becomes Shinn Road on the way) until it ends at a T-junction with Mt. Baldy Road. Take a right and go 5 miles to Mt. Baldy Village. Park next to the visitor’s center. A National Forest Service adventure pass ($5 for a day or $30 for a year) is required. Click here to purchase. (You can also reach the visitor center by taking I-210 to Baseline Road, heading east on Baseline, taking a quick right on Padua and following it to Mt. Baldy Road where you bear to the right and follow it to the village). If the gate to the visitor center is closed, park head-in outside, across from the Mt. Baldy Lodge. (Note that no parking is allowed on the private road in back of the visitor center). 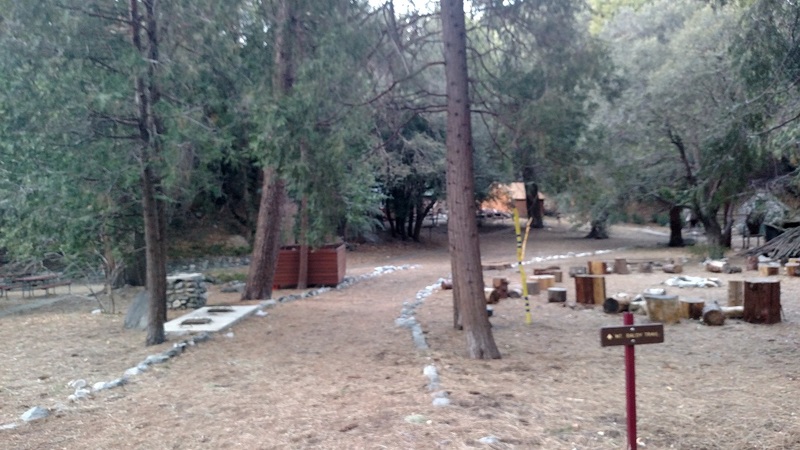 Camping/backpacking: Bear Flat has a small trail camp. For information about permits, fire restrictions and more, check the Mt. Baldy Visitor Center’s website. There are a few spots higher up on the trail that may work as dispersed campsites. Keep in mind that there is no water source above Bear Flat. For information on Angeles National Forest fire restrictions, click here. Thank you readers for your loyalty to this website. It’s always nice to hear that people are enjoying it, finding it useful and learning about new places to hike. It’s been a lot of fun to bring NHLA from its creation seven and half years ago to today, when I bring you hike #1000: Mt. Baldy from Bear Ridge. Any of the approaches to Mt. 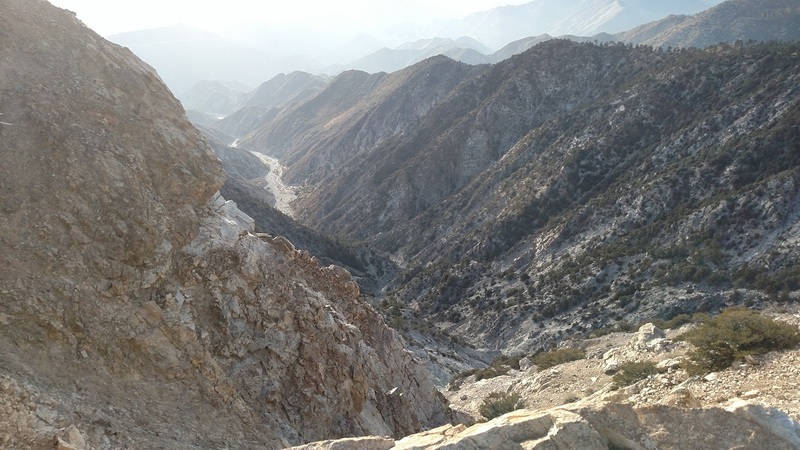 Baldy are memorable and challenging hikes but some of them are more memorable and challenging than others. 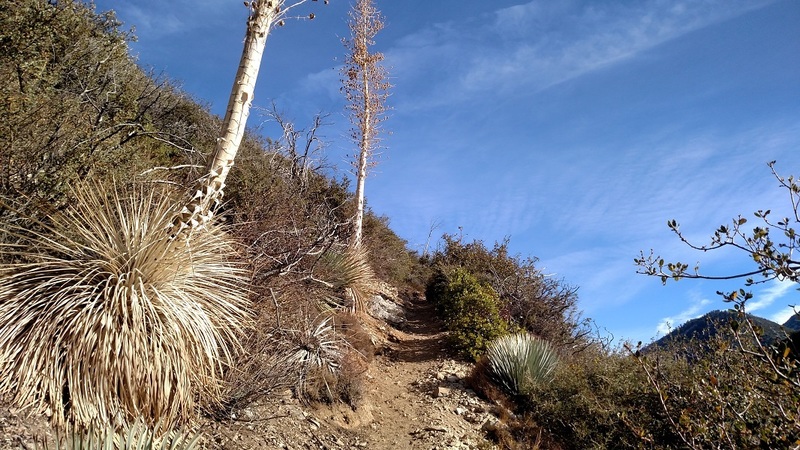 The Bear Canyon Trail up Bear Ridge on the mountain’s south face, also known as the Old Baldy Trail because it predates the Ski Hut route, is memorable and it is very challenging. 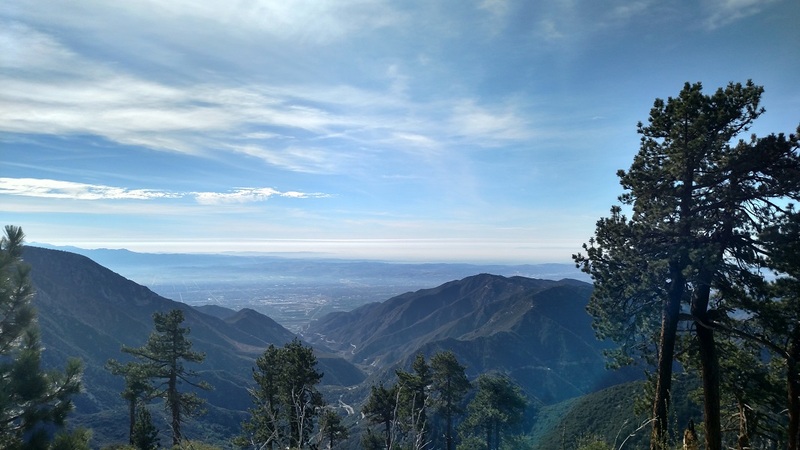 This is a hike ideal for those who have already climbed Baldy from the Notch or via the Ski Hut Trail. Because it is more strenuous, it attracts fewer hikers, although it does get regular visitation. (As of this writing, there has been virtually no rain this season, so without snow, the mountain is still accessible without specialized equipment or expertise.) The trail starts in Mt. Baldy Village and ascends for more than six very long, steep miles to arrive at the summit, well over a vertical mile higher. The views are incredible the whole way up – but they don’t come easily. From the visitor center, the signed trail leads to a private residential road where a steep ascent brings you to the start of the official trail. The first segment of the trail, to Bear Flat, a meadow at the headwaters of Bear Creek (elevation 5,530) is covered in greater detail here. While the hike to Bear Flat is vigorous, with 1,300 feet of elevation gain in less than two miles, the remainder of the trail is harder. 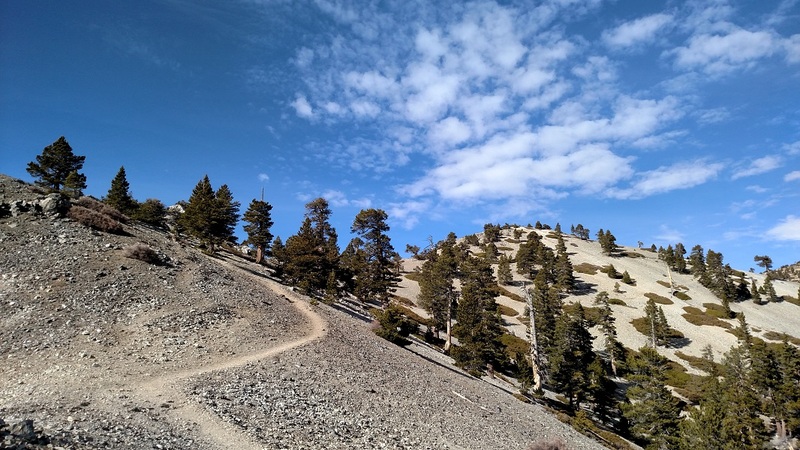 Immediately after leaving Bear Flat, the trail makes a series of steep, tight switchbacks up the eastern-facing slope of Bear Ridge. 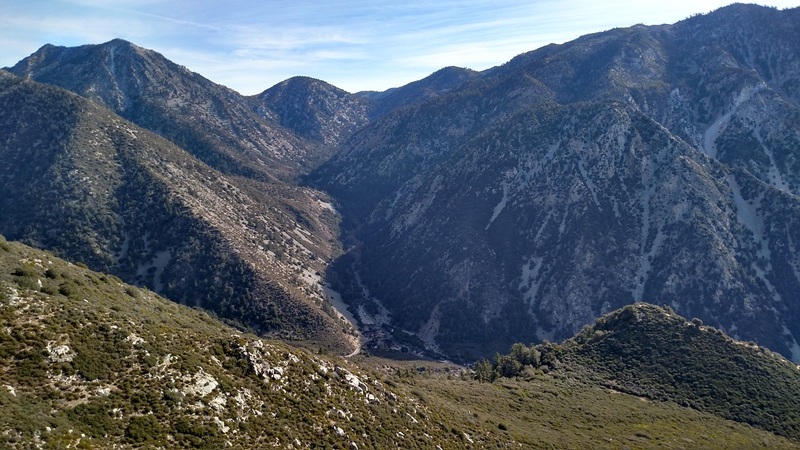 The visual rewards include a dramatic view of San Antonio Canyon and Icehouse Canyon far below; in the distance are Icehouse Saddle and the Three Ts. At about 6,700 feet in elevation you enter the shade of some pines. 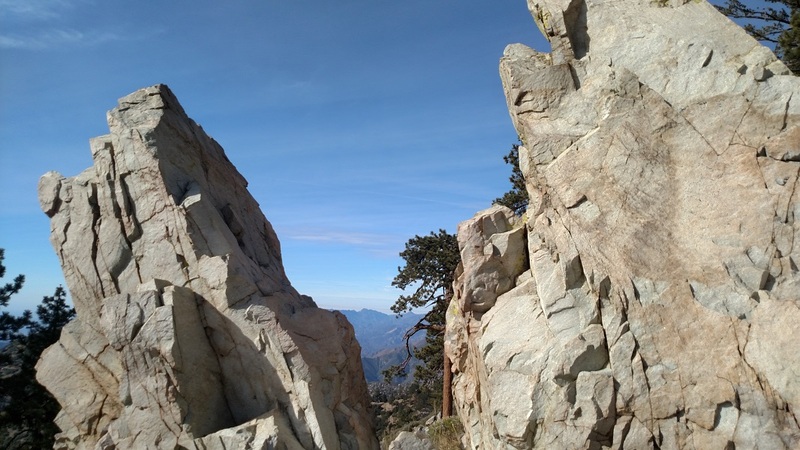 At 7,155 feet you reach a pair of jagged granite rocks known as the Three Mile Boulders. The views here are excellent. 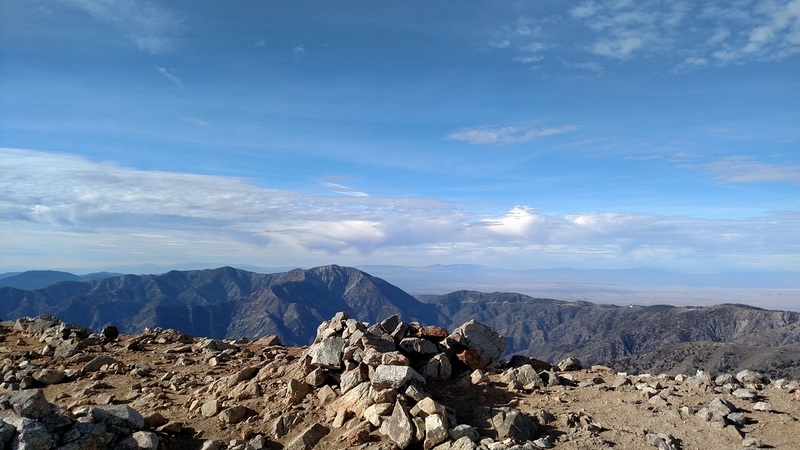 This spot marks the approximate halfway point both in distance and elevation gain, but the remaining portion of the hike is at higher altitude, meaning you will likely feel the effects. From the rocks, the trail continues its relentless climb, picking up about 1,200 feet in the next mile. One of your visual rewards is an outstanding view into Cattle Canyon, nearly a vertical mile below. Farther west are Mt. Wilson, Strawberry Peak and if visibility is good, downtown Los Angeles and Santa Monica. At about 9,000 feet, you reach “The Narrows” – a knife edge similar to the Devil’s Backbone on the mountain’s eastern slope. Like the Devil’s Backbone, this stretch of trail may test the nerves of some hikers, but if the weather is good, it’s easy enough to traverse. Exercise appropriate caution if there is wind. (Hiking poles will be helpful). By this point, most of the difficult hiking is behind you and you will see the summit, as well as neighboring West Baldy and Mt. Harwood. You will also see Mt. Baldy Notch far below to the east. 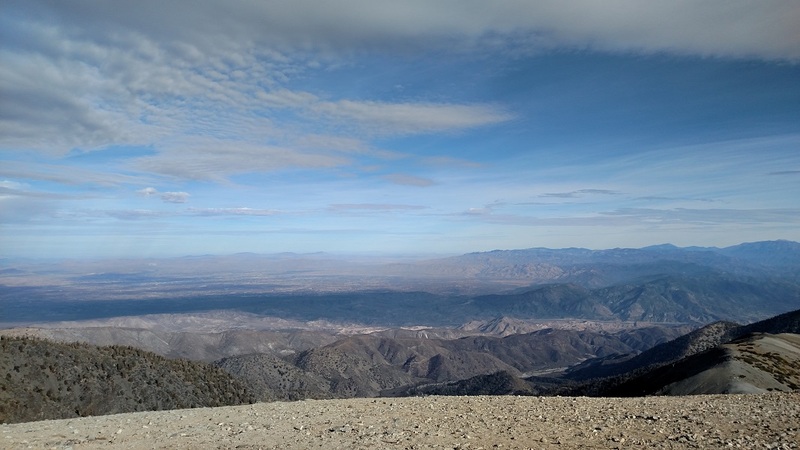 Off in the distance are the other “saints” – San Gorgonio and San Jacinto. 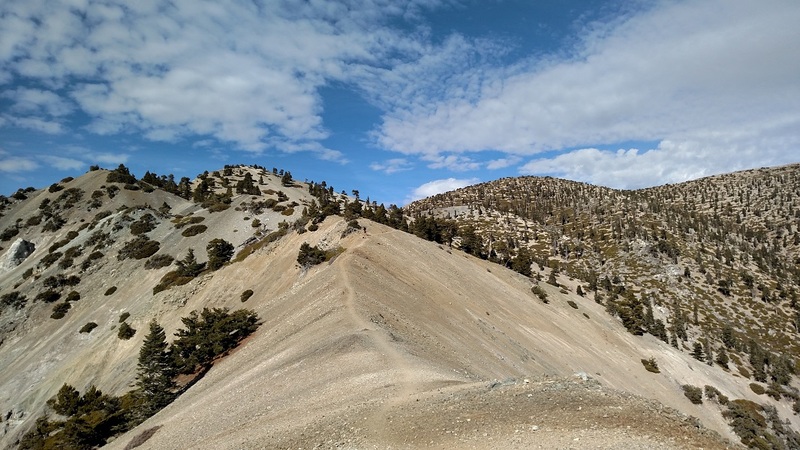 The trail then narrowly cuts across a west-facing slope (be careful as it is washed out in some spots), crosses under West Baldy and then makes its final assault on the summit. 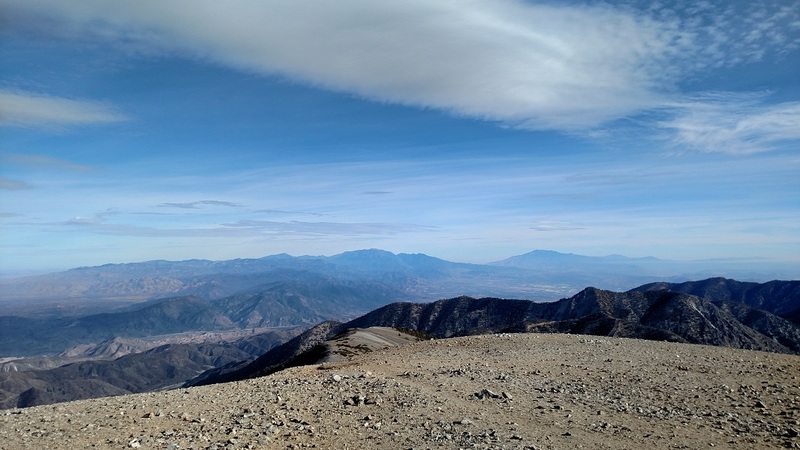 The views from Baldy are, it goes without saying, exceptional, ranging from L.A. and the ocean to the Tehachapis and Sierras to the north, the San Bernardinos, San Jacnitos and Santa Rosas to the east and southeast, the Santa Anas and Palomars to the south and everything in between. 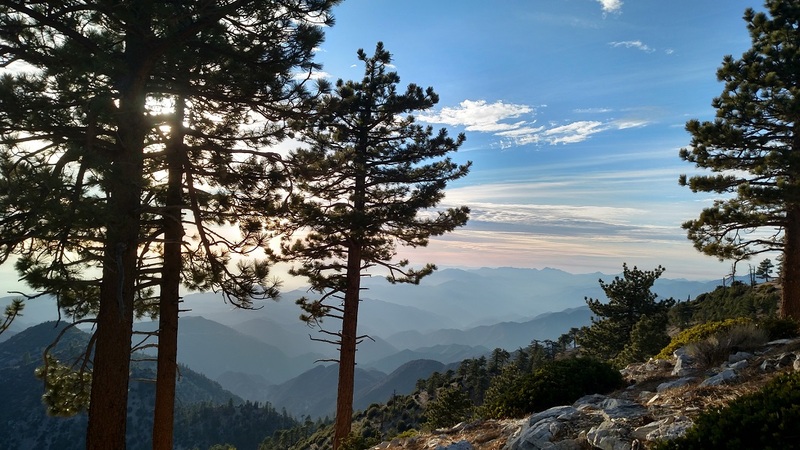 Regardless of how you get down from the summit, climbing Bear Ridge to Baldy is a major achievement and a hike that will not soon be forgotten.